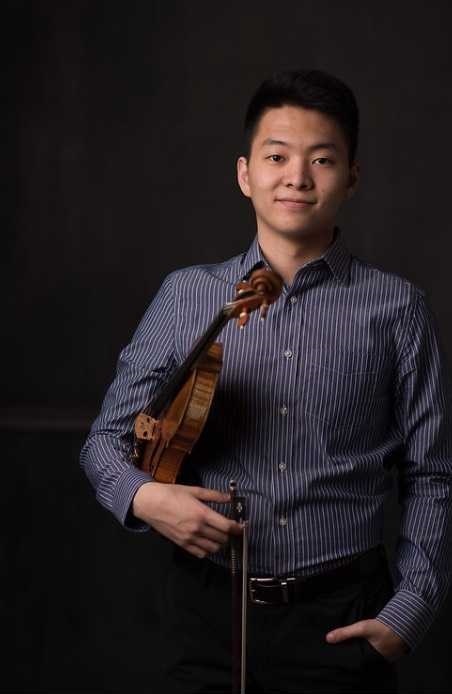 Violinist John Heo, 18, is a Scholarship Recipient Fellow at the Music Institute of Chicago Academy, a training center for gifted pre-college musicians. He is a senior at Glenbrook North High School in Northbrook, IL. John started violin at Betty Haag Academy when he was 8 years old and currently studies with artist faculty member, Almita Vamos. He has won first place and received awards in numerous competitions including the DePaul Concerto Competition (1st – 2018), Kishwaukee Concerto Competition (2nd – 2018), Chippewa Competition (2nd – 2018), DuPage Competition (2nd – 2018), Fox Valley Competition (2nd – 2018), Glenbrook Concerto Competition (winner – 2018, 2016), Walgreen National Competition Senior Open Division (Honorable mention – 2017), Sejong Music Competition (3rd – 2017, Honorable mention – 2015, 2nd – 2014, 1st – 2011), Chinese Competition (1st – 2015, Honorable mention – 2012), Musichorale Scholarship Competition (1st – 2015), American Music Institute Competition (1st – 2014), and Grandquest Competition (1st – 2014, 2013). In 2017, John had a solo performance with the Lake Geneva Symphony Orchestra. In 2015, he played as a solo guest at an Irish Spring Music Concert. As an avid chamber musician, John has advanced to the semifinals in the Fischoff National Chamber Music Competition for the last two years. During summer breaks, he has participated at the Brian Lewis Young Artists Program twice and soloed with the Ottawa Chamber Orchestra. Also, he has been to the Bowdoin International Music Festival and the Center Stage Strings. John has performed in master classes for renowned musicians like Ilya Kaler, Frank Almond, Robert Chen, and Danielle Belen. He has had chamber master classes from Marko Dreher, Ying and Calidore String Quartet. He has been playing in his school orchestras since third grade and currently enjoys being in the Glenbrook Symphony Orchestra (GSO). ​Besides playing the violin, he loves playing basketball, working out, swimming, and going to the movie theater. Margaret began her musical studies at the age of four on piano at the Community School of Arts in Wheaton College, where she also developed a love of violin, studying with Anita Arch. Margaret further developed as a musician working with Ann Montzka Smelser (at the Northern Illinois University Community School of the Arts), who was instrumental in supporting Margaret’s desire to pursue viola as well as violin. She currently studies with Helen Callus, professor of viola in the Bienen School of Music at Northwestern University. Margaret is currently is in her third season as principal violist of the Chicago Youth Symphony Orchestra. She has also held concertmistress positions in DuPage, Chicago, and Elgin youth orchestras. She is an active member of both the Resurrection Orchestra and the St. Cecilia Orchestra of St. John Cantius Church in Chicago, on both violin and viola. An avid chamber musician with over eight years of experience, she has garnered numerous awards for her ensemble work from Barnett, Discover, Enkor, Meadowmount, and Rembrandt and has participated three seasons in the Fischoff International Chamber Music Competitions. Her ensembles have been privileged to work with the Fry Street Quartet, the Jupiter Quartet, and Kikuei Ikeda of the Tokyo String Quartet, and Desirée Ruhstrat of the Bienen School of Music at Northwestern University. 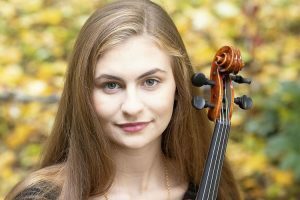 Margaret is a 2018 National YoungArts Award winner and the recipient of numerous solo violin and viola performance awards, including top awards for the Robert Stanger Young Artist Concerto Competition with the Elmhurst Symphony, the DuPage Symphony Orchestra Concerto Competition, the DePaul Oistrach Concerto Competition, the Glen Ellyn-Wheaton Music Club Contest, the Society of American Musicians, the Rockford Symphony Orchestra Concerto Competition, the Northern Illinois University Concerto Competition, and the West Suburban Symphony Orchestra Concerto Competition. Margaret has received master classes from Rami Solomonov, Shmuel Ashkenasi, Vadim Gluzman, Tong Wei-Dong, Li-Kuo Chang, Wei-Ting Kuo, Anthony Devroye, Dmitri Murrath, Steven Tenenbom, Ivan Chan, and Kurt Sassmanhaus. When she is not practicing or performing, Margaret enjoys charcoal drawing and sketching, reading, and baking. She lives in Glen Ellyn where she enjoys the company of her parents, brother and sister, and Italian Greyhound, Rosie.